Y’know, if I had to sum up why I like the series so much, beyond the obvious, I’d say that this is a DC/Vertigo love-child. Its got some really cool superheroes in it, so it has that whole DC-vibe going for it, and then, it deals with vigilantism and its effects on the common people in a very tangible way, almost like something you’d expect to be reading at Vertigo. So there’s that. I think that describes exactly what this series is all about, a bit of a silly but nonetheless apt encapsulation. Another is the scope of the story itself and everything we get to see here. We start off seeing a meeting between James Cannon and his co-conspirators, his fellow power-brokers within Coral City. Through them, we get to see what kind of an effect the Movement is having on a global scale. Then we go to a meet-up between Virtue and the CCPD Captain, who is looking to get his men back and even smooth things over the Movement, as much as possible. From there on out, we see what exactly the Movement is planning, and, as a counter, what James Cannon is planning. Given how the story ends, and some of the rather surprising moments in the final third of the issue, things are only going to get worse, since there are several new players on the chess-board now, and none of these new entrants are the good guys. Most decidedly not. One of my favourite moments in the issue is the hilarity as embodied by Mouse. He is in love with Roshanna, Tremor, apparently and he wants to impress her, so he writes her a letter. Its all really silly, particularly Mouse’s monologue to a rat while he is writing the letter, but I enjoyed it. Gail has a good handle on how to intersperse such moments of light humour in her comics. She’s done it before during her original run on Birds of Prey and in her current ongoing Batgirl. She does the same here. Its a great way to pace the story, make sure that it doesn’t get too serious, or too humorous. The art this time was a little off for me, both with the pencilwork and with the colours. With the former, there’s this one particular scene between Virtue and the CCPD Captain, in which their physical proportions are just.. unrealistic. In comparison. Virtue looks like a teenaged girl, mid-teens, or something, with a small body, but a big head. And the Captain just looks like a heavyweight WWE wrestler, but without the muscles, just the bulk. It just feels… off. And a lot of the characters are like that as well, with a bit of an exaggeration as to how they are drawn. Its odd. The colours are a bit darker than they usually are, giving the entire issue a darker vibe than the story suggests. That’s really it. Otherwise, the art is fairly spot on in general. 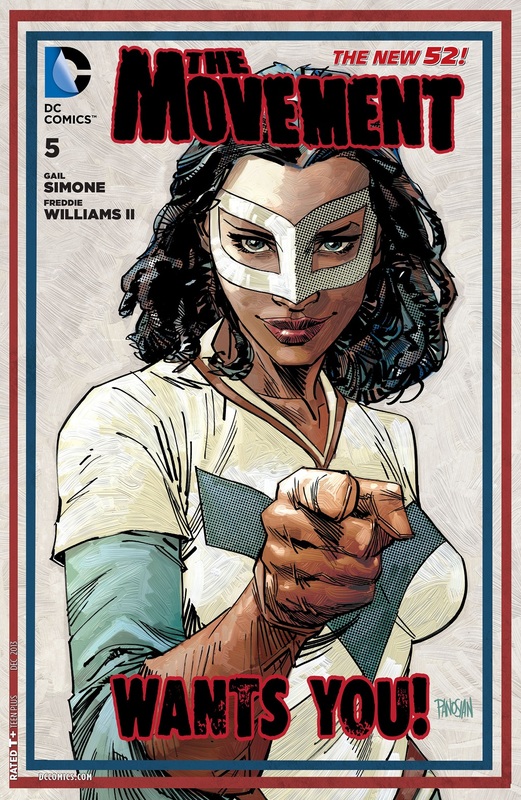 It may not have been as good as the previous issues, but The Movement #5 is still a strong issue in most respects. More The Movement: #1, #2-3, #4. Posted on October 7, 2013, in Review Central and tagged Chris Sotomayor, Comics, Comics Reviews, DC Comics, Freddie Williams II, Gail Simone, New 52, Review, Review Central, Superheroes, The Movement, Vigilantism. Bookmark the permalink. 12 Comments. Just looking at what you wrote, would the Movement be good for someone without much familiarity with the DC-verse (ie. me) to start reading without needing to worry too much about getting bogged down with continuity? Absolutely. It is a fully standalone comic in the DCU. Awesome, I might well check it out.